Dark and gloomy this Thursday evening here on California’s north coast, in the middle of a two-day storm, rain and lightening this morning, sunshine this afternoon — the second half of this weather encounter supposedly tomorrow with more rain and thunderstorms. Next week’s forecast is sun, so there’s some recompense. The face is a greenish sock of sickly flesh stretched tight over the skull. Its features have been burned away by pain. All that remain in the elongated mask are two wide round eyes with dots for pupils, a pair of black nostrils and a mouth open in an oval scream. The Scream was created by the Norwegian artist Edvard Munch in 1893 but it has become a masterpiece — the masterpiece — for our time. There are comparably “iconic” works of art — the Mona Lisa, Van Gogh’s Sunflowers — but they exist in a world of art and beauty. 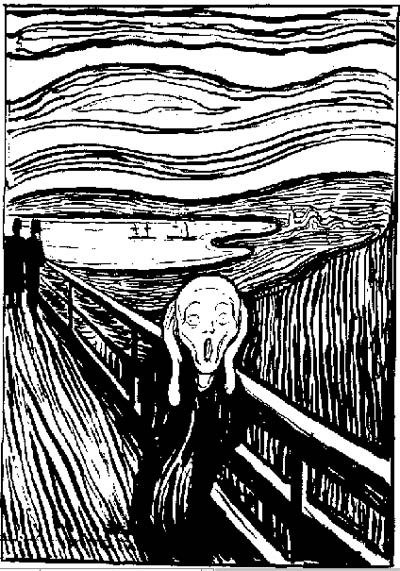 The Scream is ugly and brutal and belongs in the here and now. It is a symbol we reach for as we might for a strong word, to express what we’re feeling this minute. The cartoonist Peter Brookes called on it to sum up what so many were feeling when Donald J Trump was elected president of the United States. In Brookes’s depiction of Trump’s inauguration, every single person in the crowd has metamorphosed into the wraith-like figure from The Scream. They sway in unison, hands to their hollowed faces, clad in black smocks. By this point, it’s pretty clear that the president and the GOP are in a very deep hole. The wall hasn’t become more popular. The majority of the public blames the shutdown on Trump. A CNN poll found that just 66 percent of Republicans agree that building the wall will help solve the crisis on the border — not exactly a ringing endorsement. But, what should worry Trump the most — and could be more problematic in the long run — was this finding in the Quinnipiac poll: When asked who they trusted more on border security, Democrats in Congress were ahead of Trump by 5 points (49 to 44 percent). In other words, not only is Trump losing the argument on the wall and the shutdown, but he’s also losing on the issue of safety and security. That’s losing the battle AND losing the war.